Clean lash extensions last longer - lashes must be cleaned as part of your home care routine. Some clients believe that keeping their lash extensions away from water will keep them on longer, however this is very untrue and has quite the opposite effect! Your lash extensions will fall off prematurely when you avoid cleansing them. Yes, always avoid water for the first 24 hours as per your lash technician's instructions - however this doesn't mean don't get them wet forever! It is critical that you cleanse your lash extensions. Improper cleansing or avoiding cleansing them all together will cause problems resulting in your lashes not lasting as long as they should. Not cleansing regularly or correctly also leads to potential infections, irritations, poor lash health/growth and lash mites (yes these are a real thing!). Dead skin cells, dirt, makeup and oil will build up in your lash line very quickly! All this build up eats away at your lash extension's glue bond, breaking it down over time. Lash extension glue LOVES to be kept clean in order to maintain it's strong bond to your natural lash. Dirty lashes cause your lash glue to become weakened resulting in extensions that fall off your natural lash instead of lasting the entire life of the natural lash and falling out when your natural lash is shed. Dirty lashes don't necessarily look dirty when looking in the mirror, but under your lash technician's lamp with magnifying glasses the build up is very obvious. Clean Lash Extensions look and feel new again! NOTE: Always wait 24 hours after your appointment before cleansing! 1. Cleanse lash extensions at least 2-3 times a week or every night if you're oily or a regular eye makeup wearer. 2. Use a specific lash extension foaming cleanser to ensure you're getting an anti bacterial solution on your lashes to maintain eye and lash health. Using a lash specific cleanser will avoid potential glycols, oils and other no-no's for lash extensions that are often found in regular facial cleansers. 3. Avoid using products containing oils around or on your eye area. These include cleansers, moisturisers, cleansing oils, aromatherapy oils, spray toners, coconut/rosehip oils, eye creams, etc. If you use cleansers that aren't safe for extensions you must take care to wipe the cleasner off your face rather than rinse, as residual product will wash into your lashes. 1. Do NOT use makeup remover wipes while wearing lash extensions. They're full of nasty oils, glycols and emollients that lash extensions do not like which cause your extensions to fall off prematurely. Very prematurely! They won't last long at all when using makeup wipes. Makeup wipes are not an ideal way to cleanse your face in general as they leave residual makeup on your skin and tend to dry out your skin. 2. Do NOT use cleansing water. These products are not safe for extensions. 3. Do NOT use face cloths, sponges, makeup pads, cotton buds or other items on or near your lash extensions. These will tug at your lashes causing damage and premature lash loss. 3. Do NOT rub your eyes vigorously while cleansing - clean your lash extensions with light fingertip pressure only. I recommend using a cleansing brush like the ones I sell to my clients. Rigorous rubbing will cause premature lash loss as well as roughed up/damaged natural lashes that are short and frail and won't be able to hold extensions safely. It doesn't take much to cause damage to your lashes, so always be gentle! When should you clean your lash extensions? Clean your lash extensions at least every other day - or every day if you're an eye makeup wearer or have oily skin or eyelids. I recommend cleaning lash extensions at night to remove the days worth of facial oils, dust and makeup. Clean lash extensions after activities such as swimming, working out/gym, wearing sunscreen (make sure your sunscreen is oil-free). 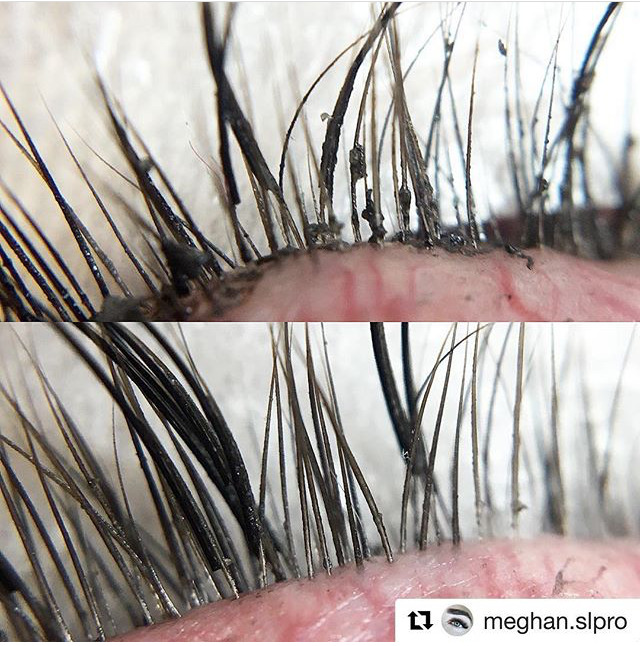 Chlorine, salt, sweat and oils should be removed immediately from lash extensions to maintain the integrity of your lash adhesive. Please watch the below video for how to clean your lash extensions correctly. I think this video really explains everything well. It's helpful to watch how it's done rather than guess how to do it. If you'd like to purchase lash extension products to ensure a long lasting set of lash extensions please visit my Lash Shop. Shipping is available to Australia, New Zealand, USA and Canada. I hope this post was helpful to you, remember to subscribe to the blog further down this page to get email updates on future posts.